4ocean is an organization whose story begins with two men name Alex and Andrew. The two were surfers who took a trip to Bali Indonesia after graduating from college. Upon arriving, they were devastated by the amount of plastic they found in the ocean and along the coast. They saw fishermen who were no longer able to move about freely when fishing and knew that something must be done. Alex and Andrew worked with the local fisherman to create sustainable cleanup efforts which ultimately resulted in the founding of 4ocean. Where does Thern play a role in all this? 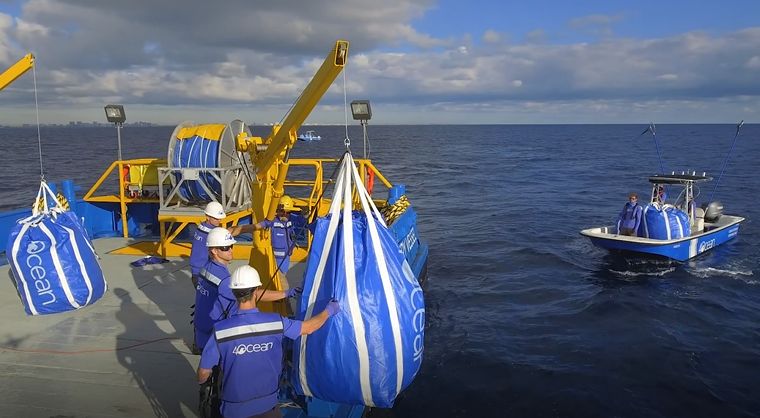 4ocean utilizes two Thern Captain Series 2,200 pound capacity davit cranes to pull giant bags of plastic off small boats onto a much larger ship. That ship subsequently returns to shore, bringing tons of plastic waste to be recycled. In harsh off-shore operating conditions, 4ocean knew that their cleanup crews needed the reliability and performance that Thern products are known for providing. The Captain Series guarantees the crew 360 degree rotation of the crane, adjustable height/reach, and smooth load control with the inclusion of a Thern electric winch. Rain or shine, 4ocean and Thern winches and cranes are helping to clean our oceans of millions of pounds of plastic waste. “My name is Dave Vandenabeele, I work with Alex Schulze (one of the founders) at 4ocean. I’m the Project Manager for the OPR (Ocean Plastic Recovery) Campaign so my teams have been using the davits you were nice enough to supply us with. The entire Thern team wishes to thank 4ocean for their trust in our products, but more importantly for the tremendous work they are doing to rid our oceans and beaches of plastic pollution. We encourage everyone to join the 4ocean team and support their mission by buying a bracelet at https://4ocean.com and removing plastic waste from our oceans and coastlines one pound at a time.